The war is primarily associated with weapons, aggression, death and the military, who have the duty to protect the country. We do not often recall the military chaplains who are in the combat zone near the military. Even those soldiers who never went to church in a peaceful life and did not want to hear about God, in war requiring the presence of chaplains. They need spiritual advice, prayers, friendly conversations and support. Serving as s chaplain is a very difficult and responsible matter. To know how to behave in this war, how to be help and support, how to win the trust of the military, how to carry the word of God and His peace in the hearts of people – they have to study. 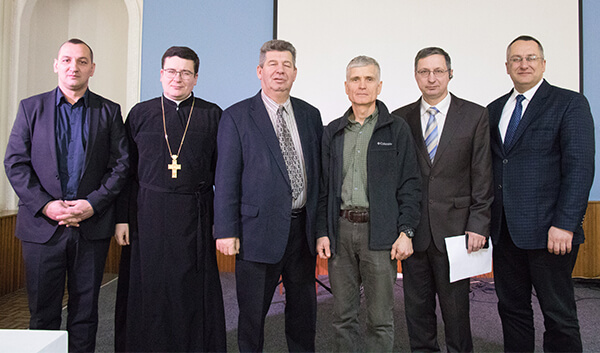 Professional Capellan training can be obtained at the bachelor program “Pastoral-Chaplain leadership” in the Kiev Theological Seminary, on the basis of which the annual training seminar for the acting chaplains takes place. 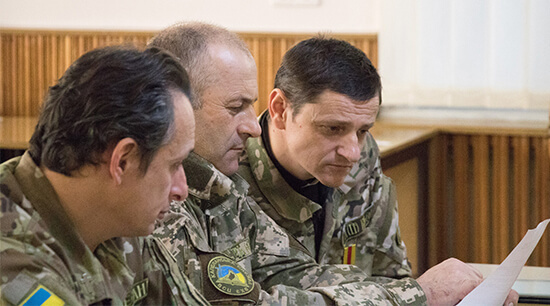 January 24-26, 2018 The Kiev Theological Seminary hosted military chaplains from all over Ukraine at the annual training seminar for military chaplains of the WCC ECB. During the three days of training, many important chaplain topics were raised and discussed. This year the speakers of the seminar were Ukrainian chaplains, who talked about their practical experience of serving in the war zone. The lectures revealed the features of pastoral work with the military. In an open discussion, the ethics of the sermon and the rules of behavior of the chaplain-Protestant in the war zone were discussed. The sense of respect and submission to the rules and laws of military service was emphasized. The ability to show one’s faith in deeds to gain the trust of soldiers is one of the most important skills of the chaplain. 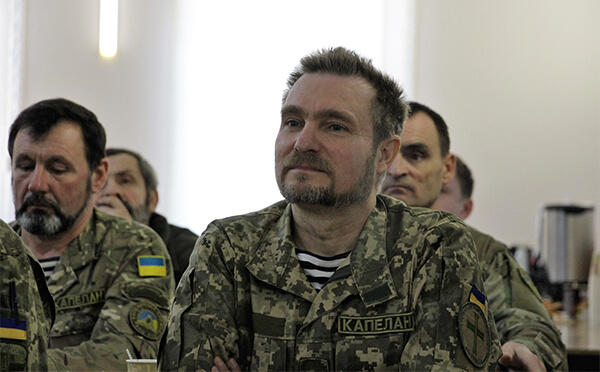 Particular attention was paid to the topic of working with children in the gray zone, since the chaplain is a person to whom the children of the combat zone have special trust. Attention was paid to the topic of information hygiene, it was said about the importance of being attentive to information that the chaplains hear and disseminate. Ability to think critically, check information as carefully as possible, carefully distribute these or other media files – these security measures can save lives and prevent the spread of panic or frankly false information. Biblical texts that talk about patriotism, love for the country, talked about how to find solace in the Lord in loss, sorrow, the experience of suffering, how to be a man of peace, a man who brings peace and what the Lord says about it in His Word. These and many other important topics were revealed in three days of training and communication chaplains. Welcoming words and encouragement to the chaplains were addressed by the Rector of the KBS R. Khmyz, the representative of the WCC ECB in the Council for Pastoral Care, M. Andrashko, the Senior Chaplain of the WCC ECB V. Khimich, the representative of the CCEE in the RDPO M. Mikhaylishin, the Director of the “Pastoral-Сhaplains Program” KBS V. Korenevich, President of the WCC ECB V. Antonyuk. Greeted the chaplains and spoke about the Capellan service of the Ukrainian Greek Catholic Church, the deputy head of the Department of the Patriarchal Curia of the UGCC for the Ministry of the Ministry of the Ministry of Justice of Ukraine, Father Lyubomir Yavorsky. 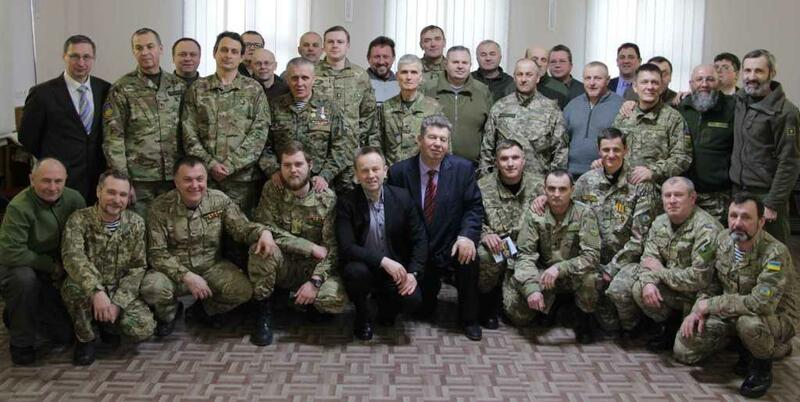 The representative of the Ministry of Defense of Ukraine, Colonel A. P. Gerus, addressed the chaplains with a report on the current state of affairs of the chaplainous ministry of the Armed Forces, taking into account the current legislation, answered questions from the chaplains, and presented memorable awards from the Ministry of Defense of Ukraine. Among others, Sergey Nayuk, a student of the first year of the Bachelor’s program of the KBS “Pastoral-Сhaplains leadership”, was awarded. 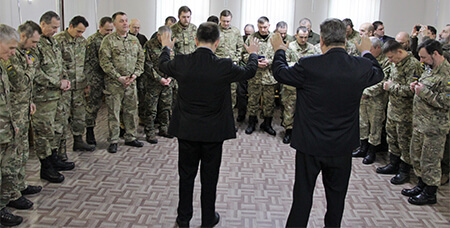 It is worth noting that for the present military chaplains in the APU are three graduates of the seminary, two students of the program “Pastoral-Сhaplains leadership”. 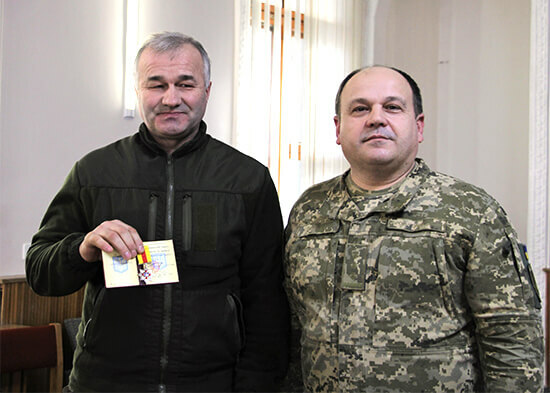 Another student of KBC is a chaplain in the National Guard of Ukraine. The conference ended with a prayer of blessing and asking for God’s mercy and protection for the chaplains.